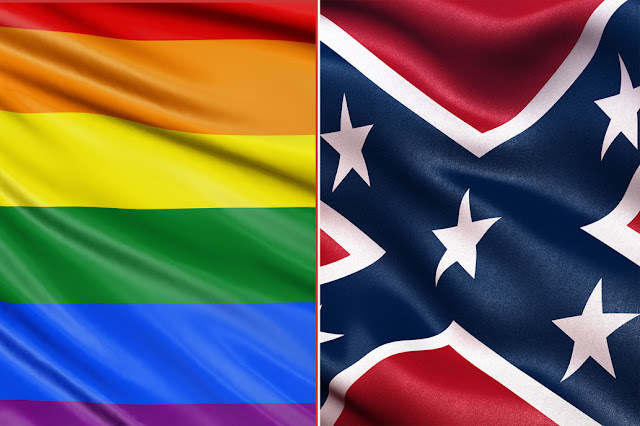 A group of students and parents in Alabama is calling for the removal of a rainbow pride flag from a high school classroom — arguing that it can be compared to displaying a Confederate flag. “We strongly feel that it creates a hostile and provocative learning environment for students not comfortable to openly supporting the LGBTQ+ community in a public school where students come from diverse political and religious backgrounds,” a Change.org petition reads about the flag in Auburn. More than 800 people have signed the petition demanding the flag on display just outside of a classroom at Auburn High School be taken down. The flag was hung last week during a school fair for the school’s Educate club, which promotes diversity, according to NBC affiliate WSFA. The petition — started by Andrew Monk and directed at Principal Shannon Pignato – compares the pride symbol to the Confederate flag. “[T]he signers of this petition would like for you to consider the uproar and chaos that would ensue were a teacher to hang for example a Confederate, Christian, or Heterosexual Flag in their classroom,” the petition says. A counter-petition against the original petition has sprung up on Change.org, garnering much more traction with more than 6,690 supporters.